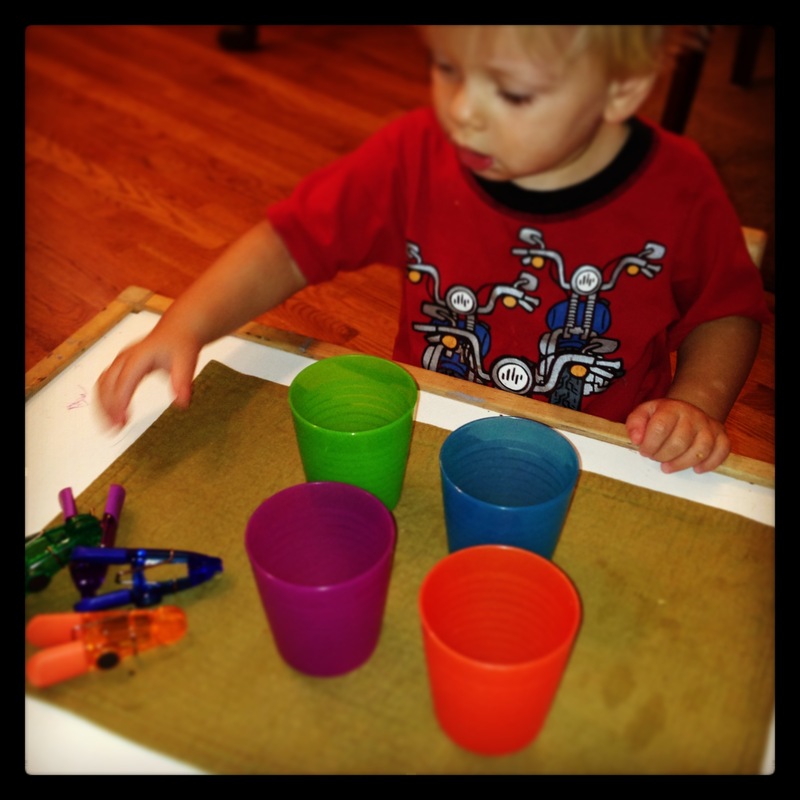 We are enjoying our Montessori toys found on Etsy! 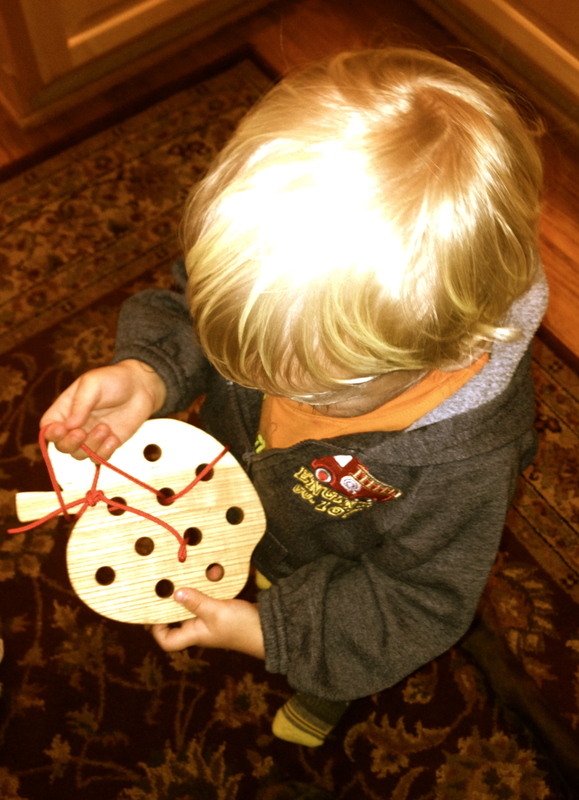 All the handmade toys from Essential Montessori look amazing! 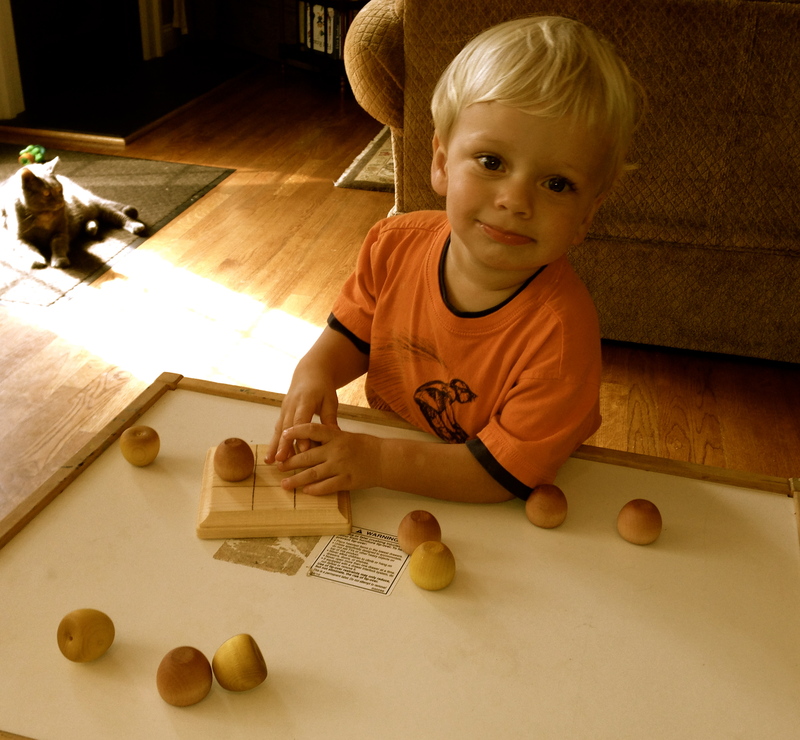 I bought the tic tac toe board with apples for B. He’s having fun just feeling them. We’ll eventually play the game but for now we just sort and place them. I can’t wait for a baby shower so that I can get the mobile and baby gift set! 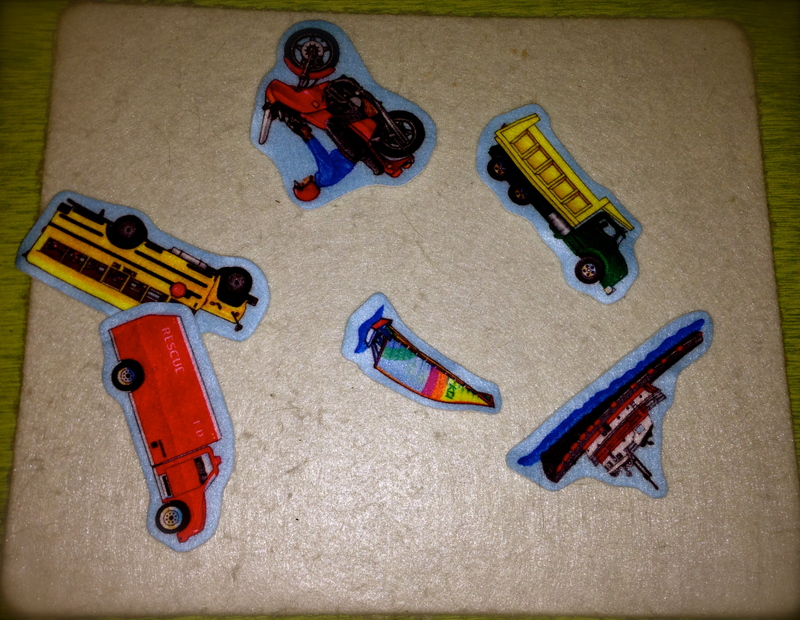 Categories: Toddler | Tags: Essential Montessori, Etsy, Montessori, The Elephant Playthings, toddlers, toys | Permalink. My 22 month old is working on letter recognition and phonics. We have letter activities all around the house. B thinks it is hysterical when I pretend that our foam letter “H” is very hot. I toss it up in the air and yell “hot, hot, hot!” He wants me to do it over and over again. And I do. B has “H” and the word “hot” down solid because we made it a fun game to learn the letter “H”. Now if we could just figure out “cold”. It took me awhile to realize that B was saying “hot” and meaning “cold” when the weather turned cold and things like his car seat were very cold. The point is that we try to make our letter activities a fun game. 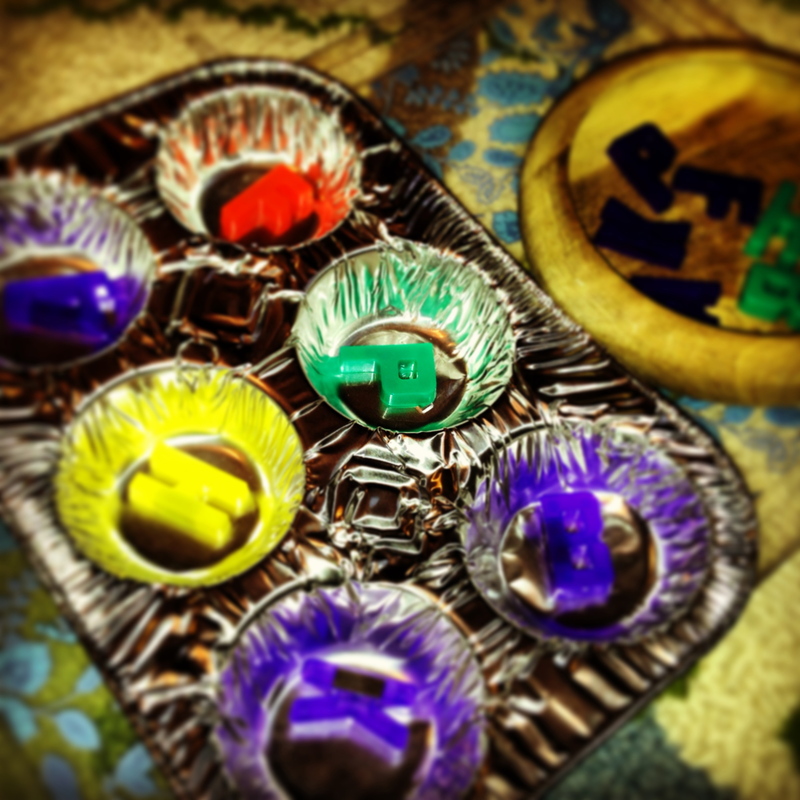 This week we matched magnet letters in a muffin pan and integrated letters into the felt board. B loves playing with his felt board. I recently bought a set of felt vehicles. I wasn’t sure how to make it a letter learning activity until this week when we talked about the first letter of each vehicle. I wrote the letter on our chalk board and then B found it on our alphabet sheet. B was very excited to find the letters. 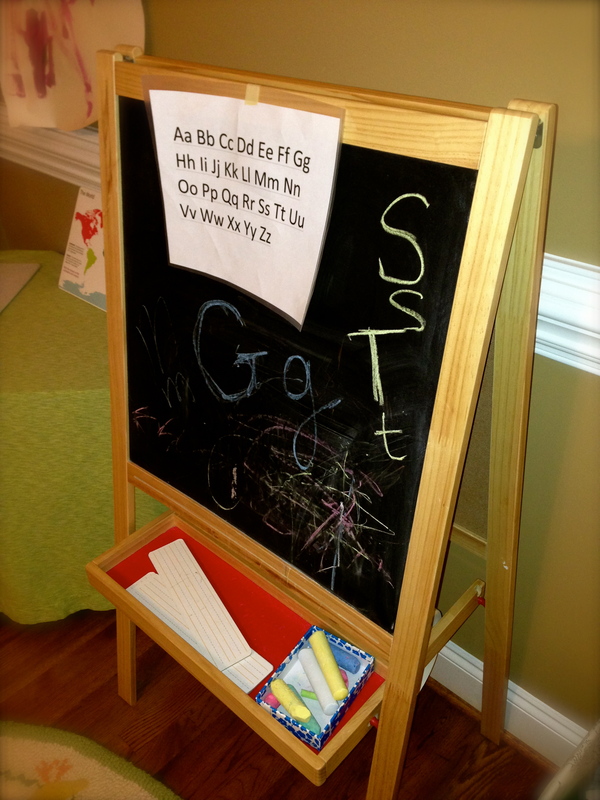 Here are some of our other letter activities around the house. On our shelf I put out a small mirror with a few magnet letters on top. B likes laughing at himself in the mirror. We talked about the letter sounds that he found on the mirror. 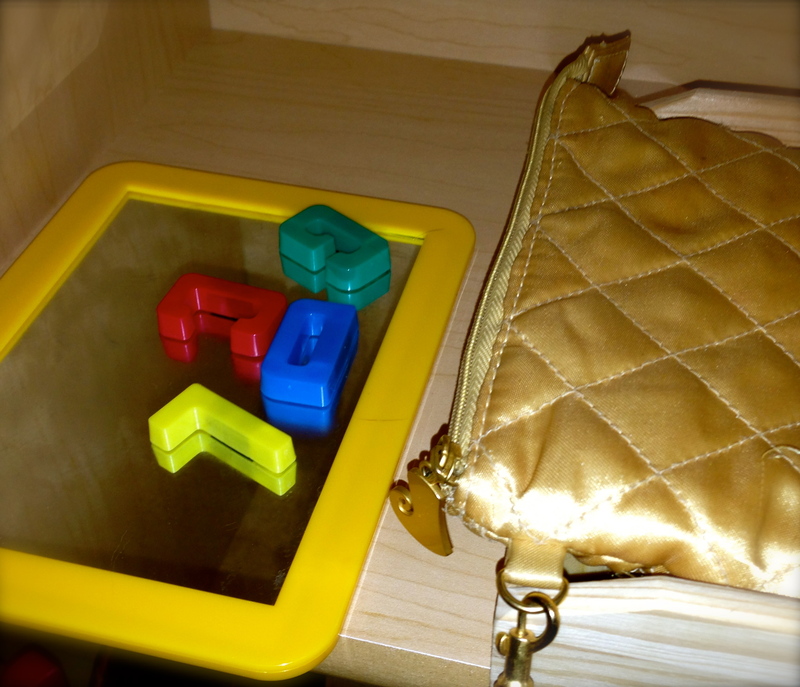 Sometimes I hide letters in the purse shown next to the mirror. B is working on zipping as well. I have a basket of large foam letters. I put the letters out on the floor and B finds the letters as I call them out. I ask him to stand on the letters or hand them to me. We have a basket of small foam letters in the bathtub, along with numbers. B likes it when I line letters up on the side of the tub and ask him to find them. When he finds the right letter he throws it in the water and we yell “bye, bye D” or whichever letter we’ve picked. 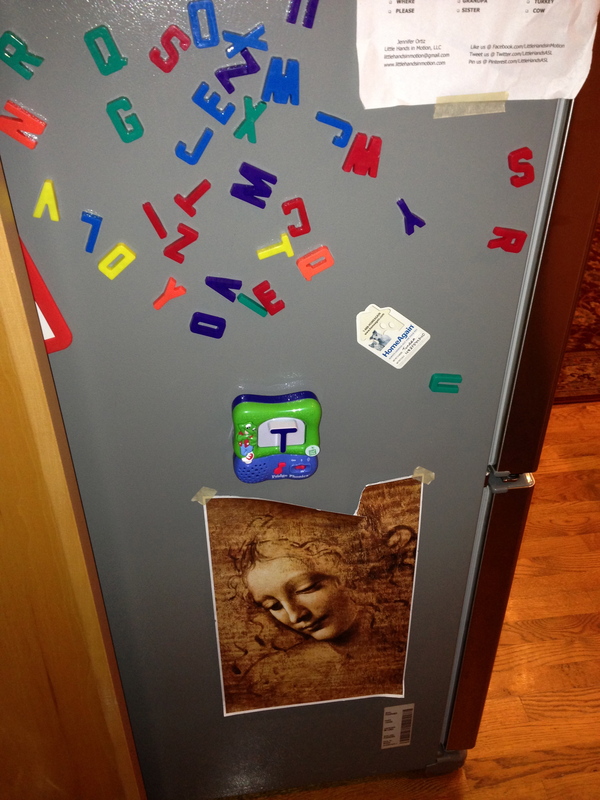 Finally, like many families, we have magnet letters on the side of the refrigerator. We also have a LeapFrog Letter magnets. I have two set of alphabets for matching. Sometimes I make a short word on the frig and B matches letters underneath mine. I will also trace the letters onto an index card or piece of paper and B will fit the letters into my traces. I try to put a picture of the word next to the word. If the word is mom, I’ll put a picture or me. Or if the word is sun, I’ll put up a foam or sticker sun. You can also make Letter Tubs and Letters with salt or sand. What are your favorite letter activities? Categories: Toddler | Tags: abc's, at home, chalk board, felt board, Learning, letter matching, letter pairing, letters, mirror, Montessori, Montessori DIY, sandpaper, toddler activities, tubs | Permalink. 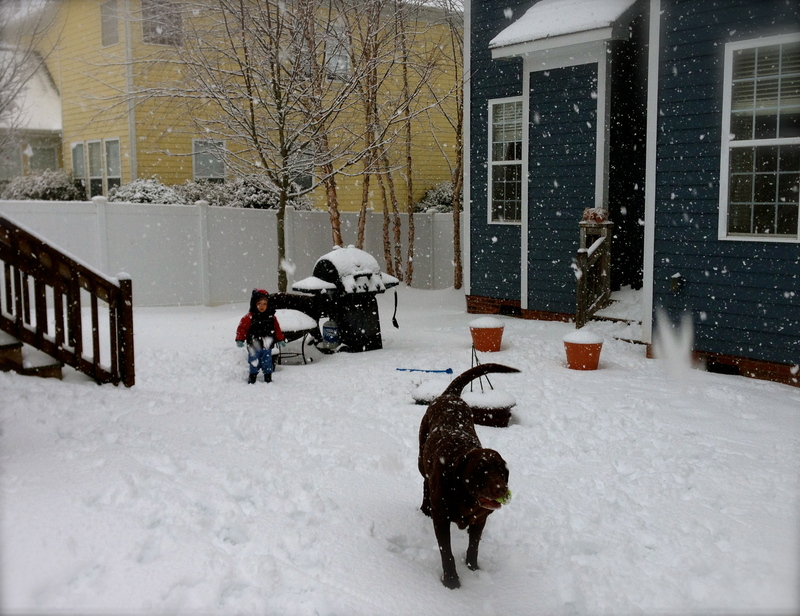 We had an awesome snowstorm the last two days considering we are in blue sky North Carolina. 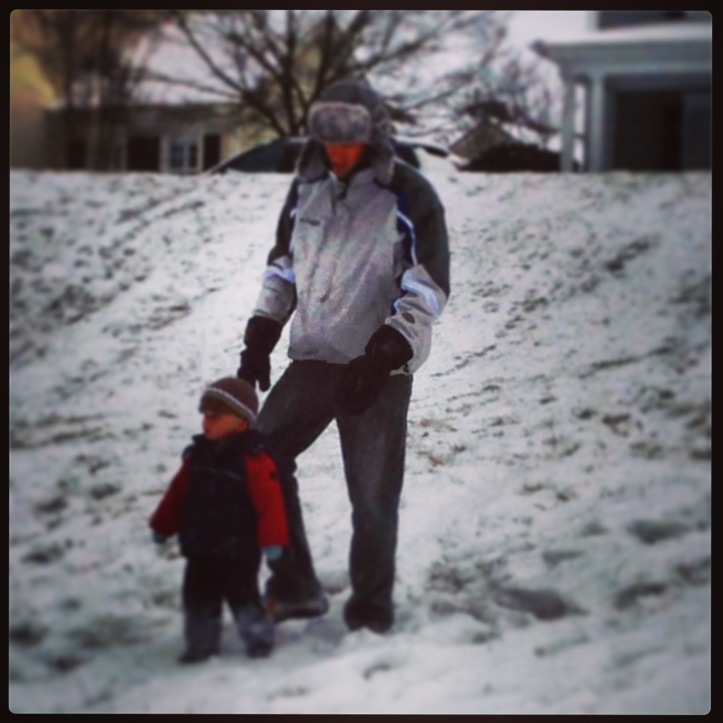 What do you do on snow days to keep your toddler busy? I rotate toys about twice a day and put out new activities anytime he’s not looking. 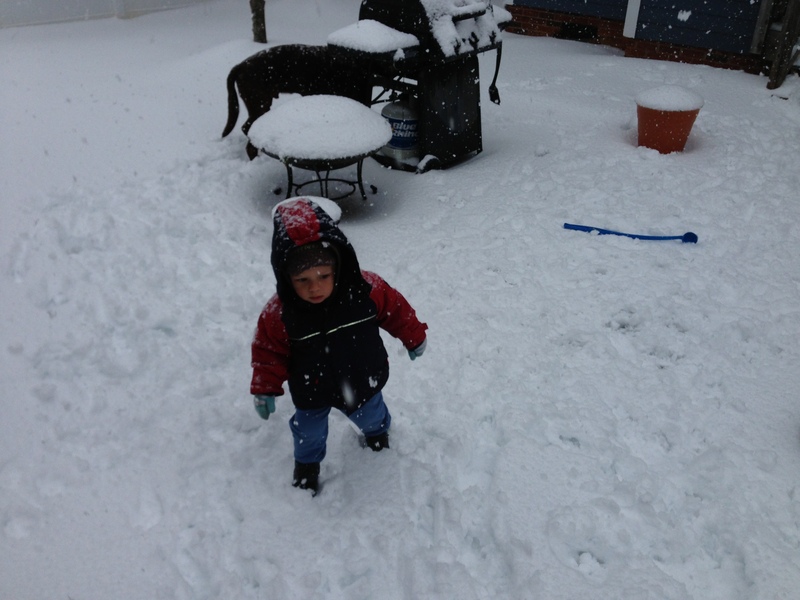 And, of course, play in the snow! 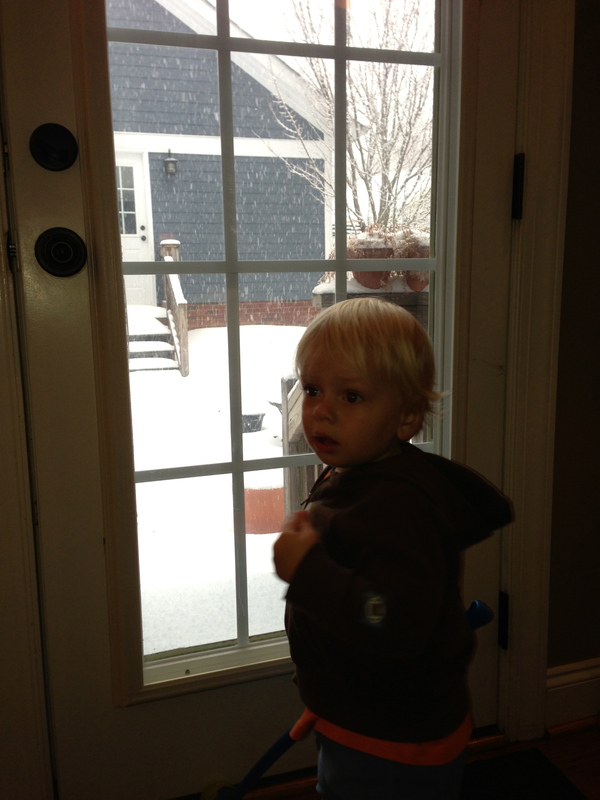 We had a long conversation about why the snowman couldn’t come in doors for a snack. We made some bread pudding and organized kitchen cupboards. B was completely engrossed in a food processor box! He loved seeing all the things hidden away and investigating how they worked. 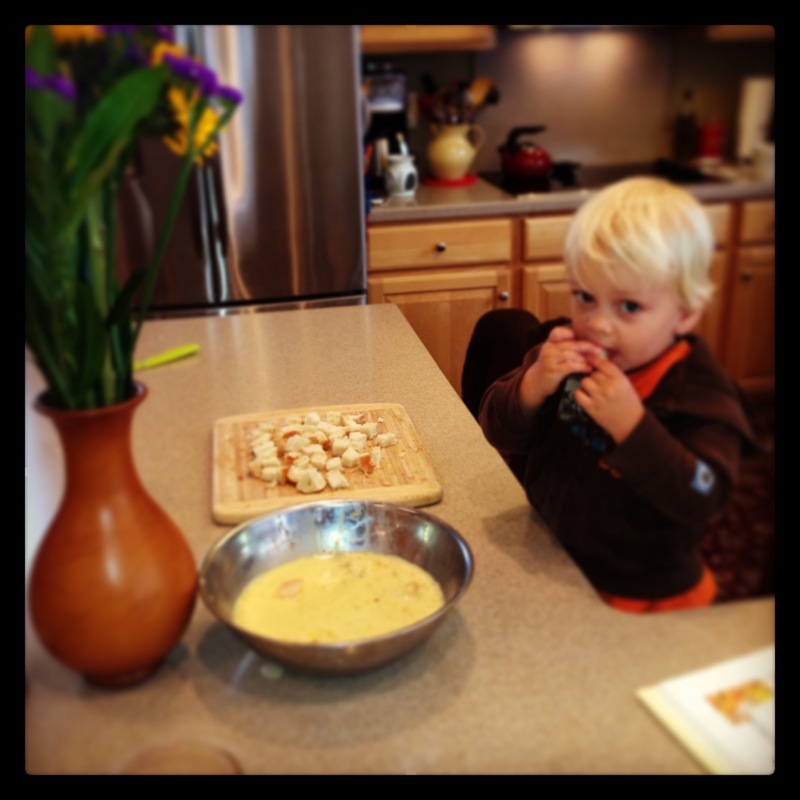 He was also completely fascinated with making bread pudding. 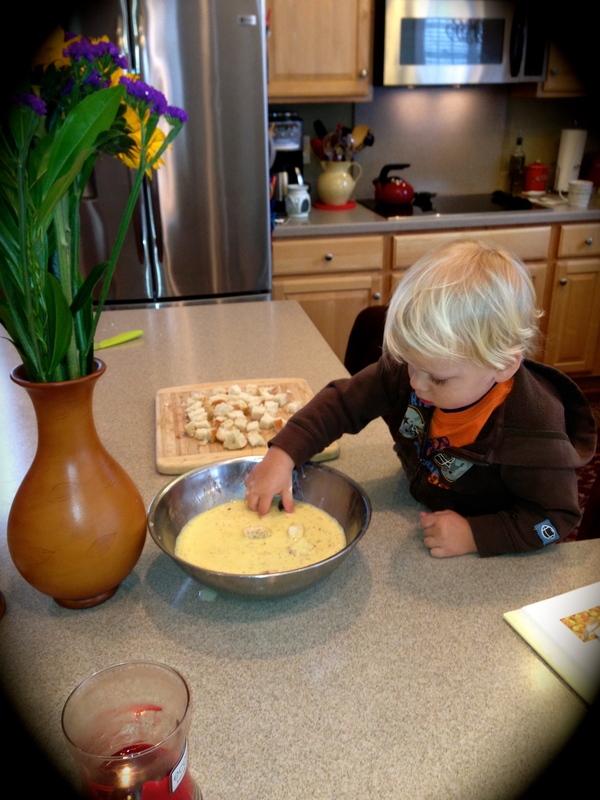 He stirred the custard mixture and put bread in the bowl. One for him, one for the bowl. 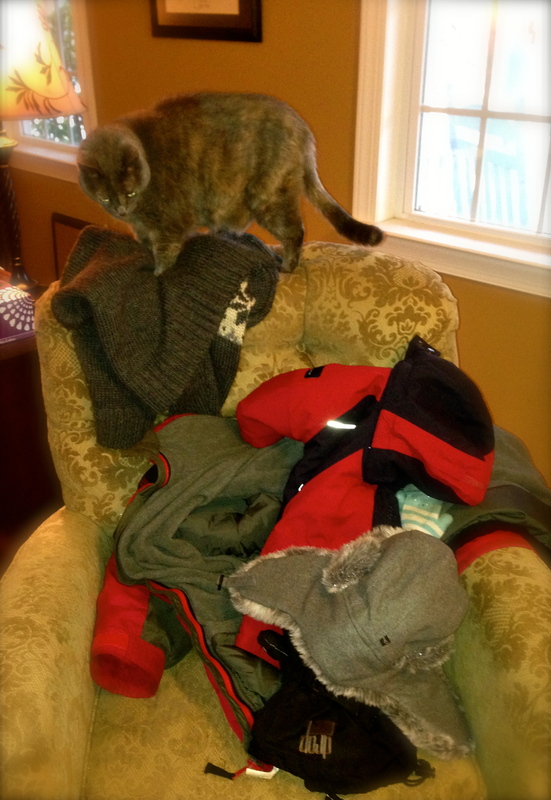 Then he helped clean up. He enjoys wiping up the counter and doing dishes. Who needs movies! This stuff took all day! Nothing against movies. We watched one last night with big bowls of popcorn! We also did our usually books, potty time, and various other Montessori-style activities (which I’ll put in my next post). 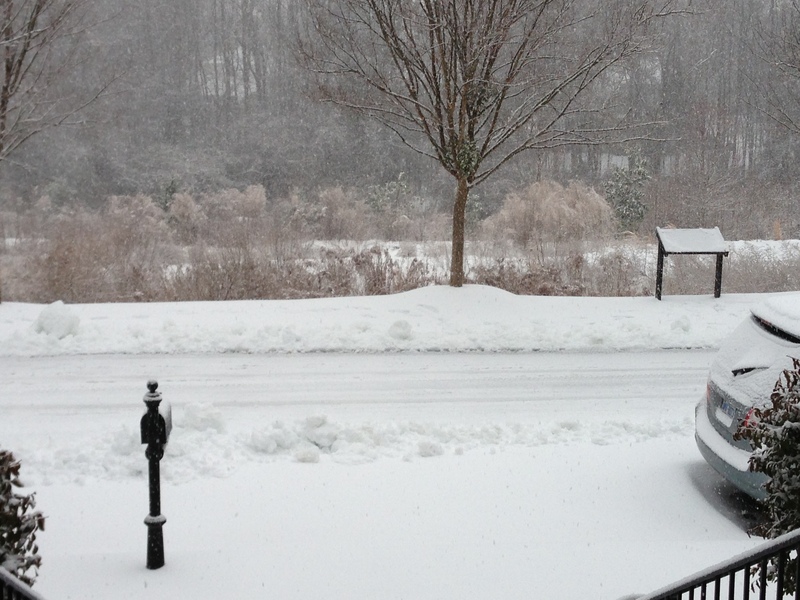 For now, signing off from NC’s winter wonderland! P.S. I’m pretty proud of my snowman! 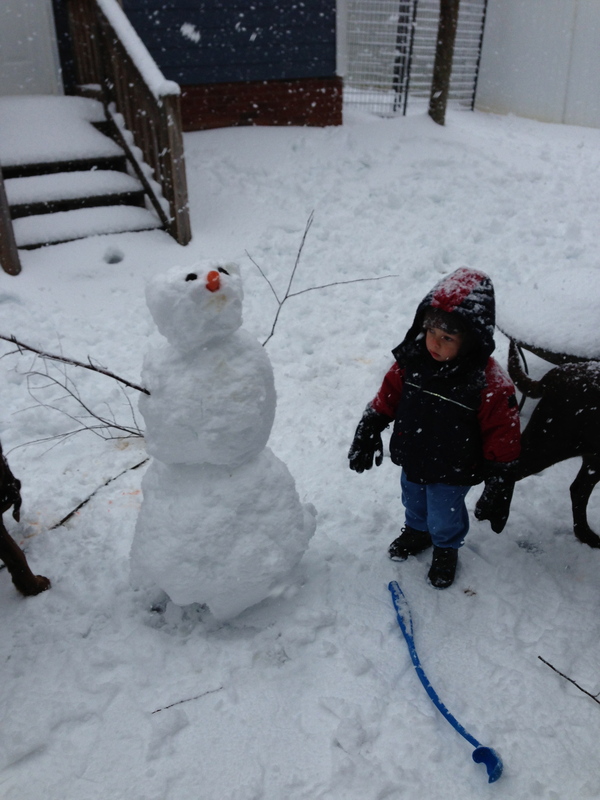 B supervised and the dogs tried to eat the nose! With all that being said, it turned out okay. 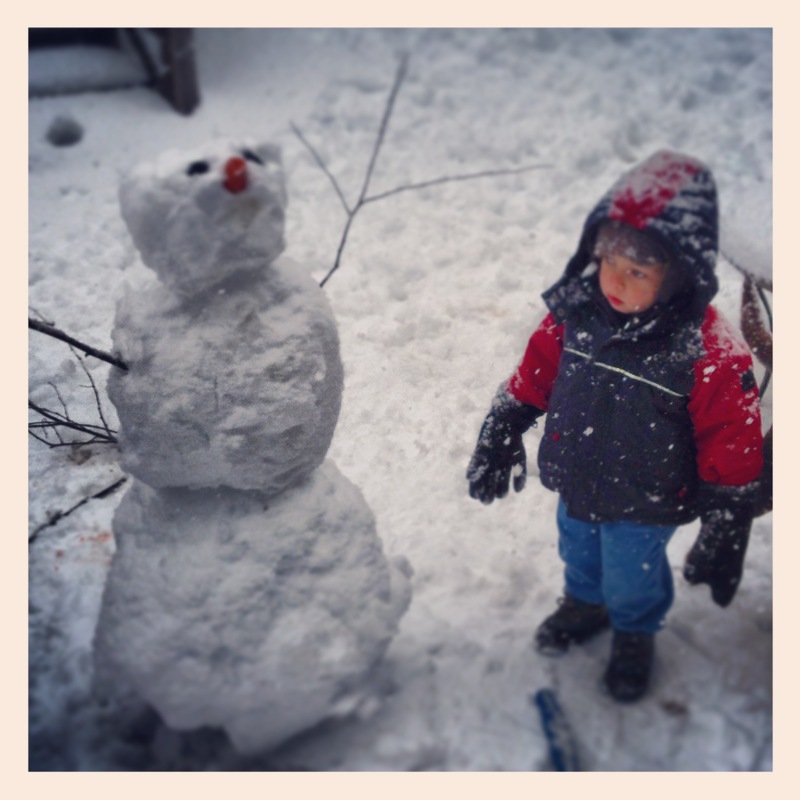 Categories: Toddler | Tags: activities, cooking, Montessori, snow, Toddler, winter | Permalink. 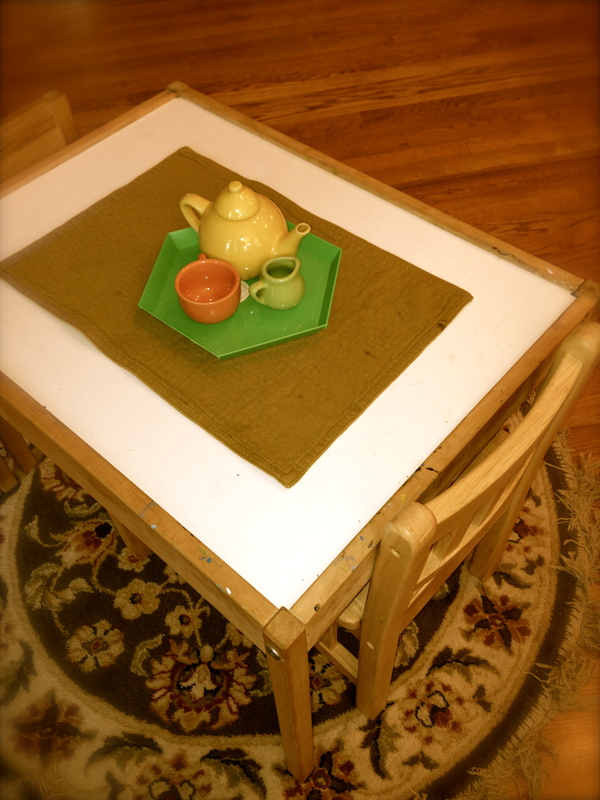 Here are some toddler activities that we have enjoyed recently! My little guy is 22 months but there is a wide range of ages that would enjoy these activities. 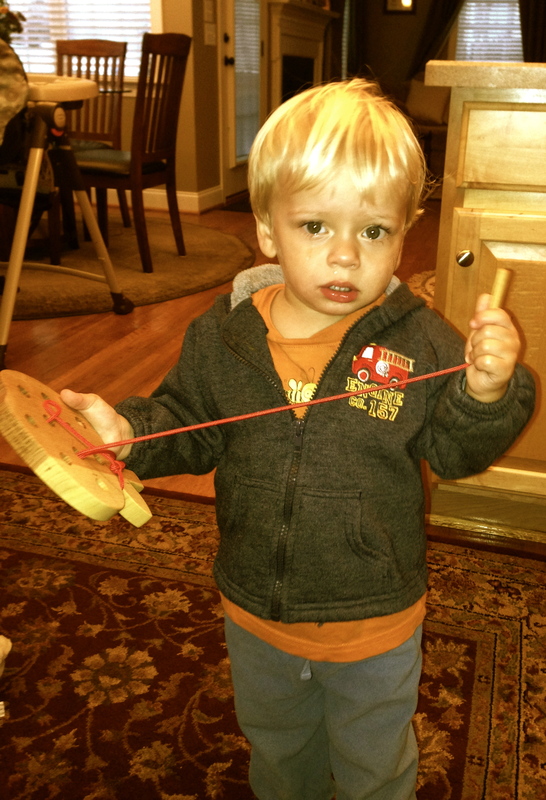 What are your favorite toddler activities? 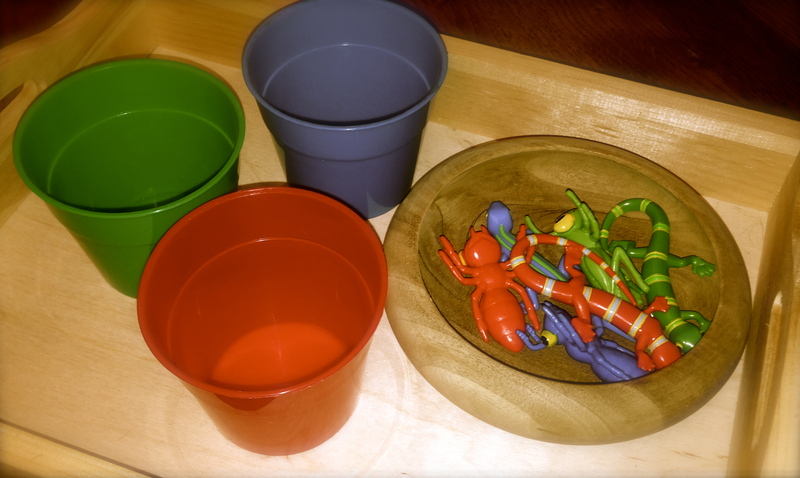 In this activity, B is matching colored chip clips with the same color cups. He can pinch them onto the side of the cup or just place them inside. This pincer exercise is a little easier than regular wooden clothespins and the color are interesting. I found these chip clips in the grocery store and the cups are from Ikea. Here is another pincer activity with chip clips. 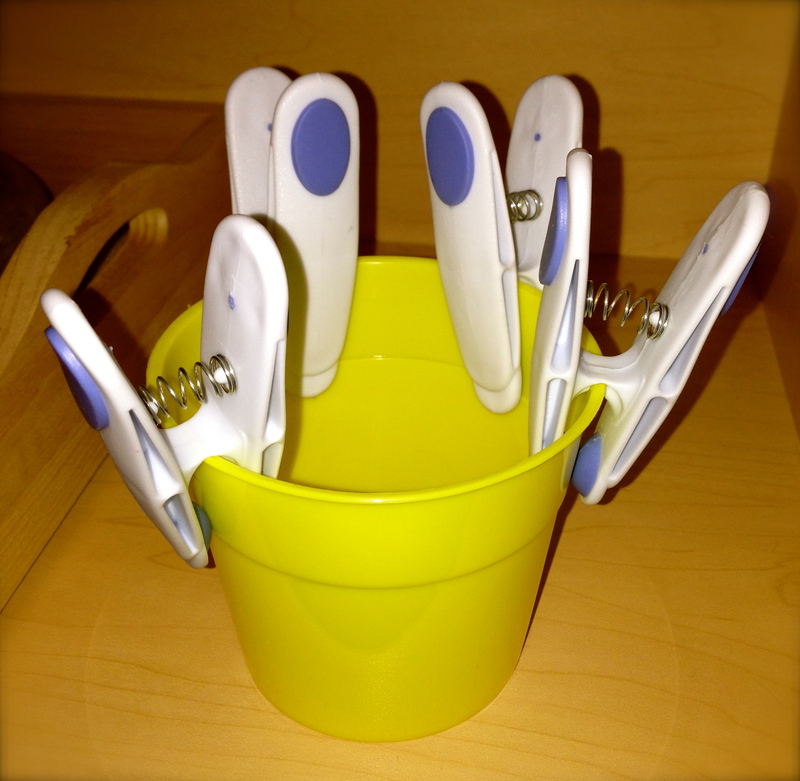 If the toddler is just learning this type of work, he or she can pull the clip off and place them in the cup. Ounce they have mastered pulling off the clips, they can work on putting them on the side of the cup or basket. Here are two color sorting activities. Since B is getting efficient at this activity, I added lids to the work. 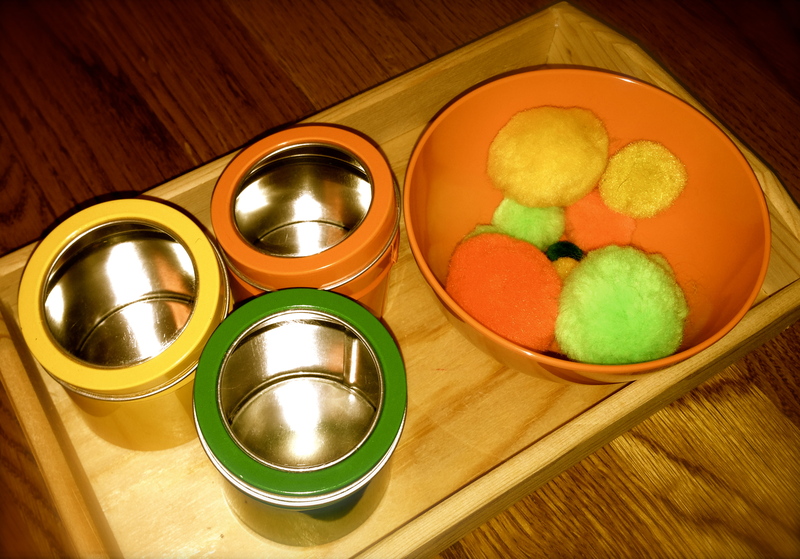 The orange, yellow and green canister lids that I picked up at Michael’s are challenging but manageable to get off. The second color sorting activity is a little more challenging because the bugs have some different shades and patches of other colors. Also, bugs are just fun! 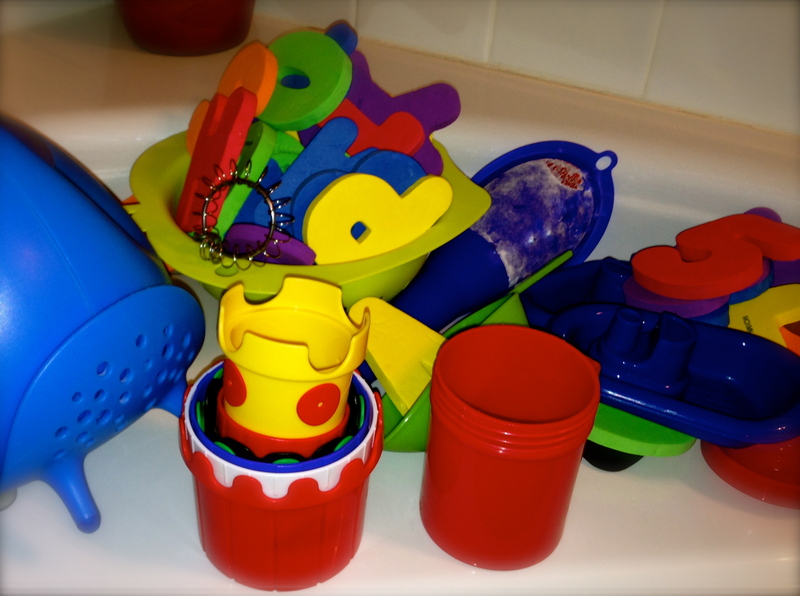 Here are two practical life skill activities for your toddlers. 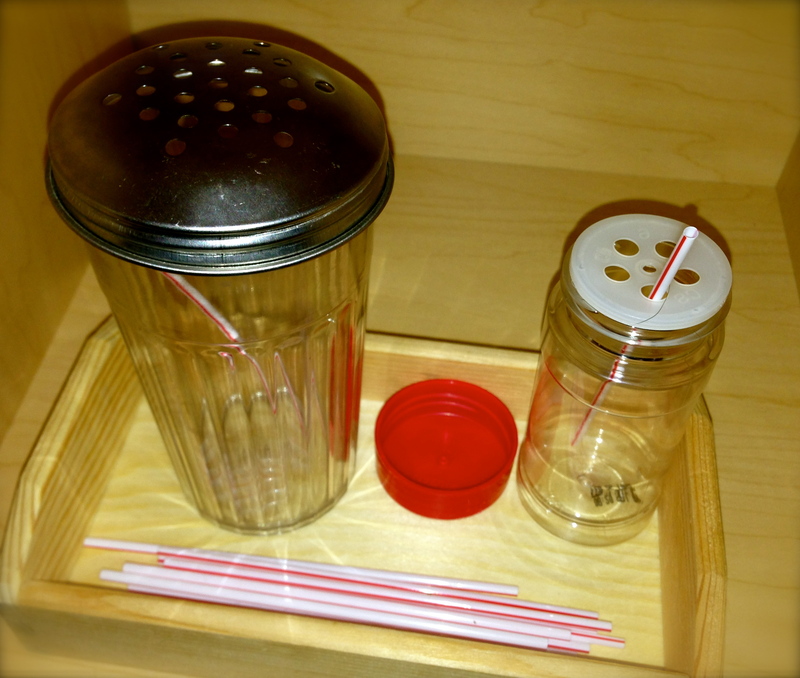 The first is placing stirring straws in two different shakers. The second is a tea set. B has really enjoyed the tea set recently. He transfers water between the dishes. He spills it all over the place but we clean it up together with a dish towel. We have recently enjoyed simple memory games. 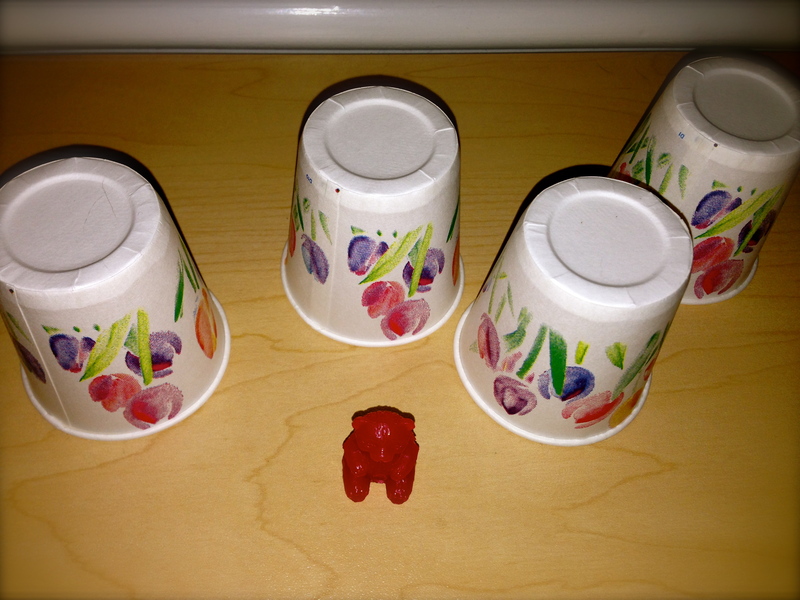 Here I put the red bear under a cup and let B find it among some other cups. B thought this was pretty funny! Silly bear. It’s like advanced side and seek. Finally, here are some fun pictures from around our work/play room and house. 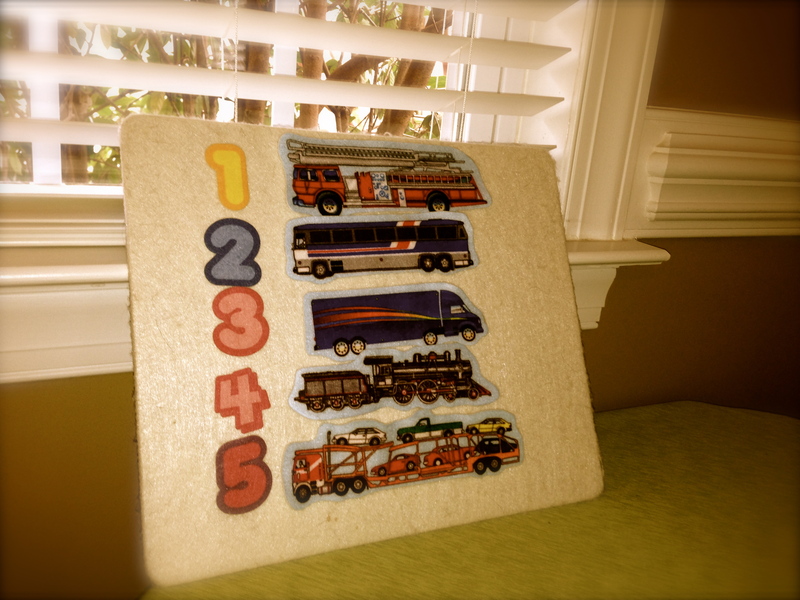 B loves transportation so we count vehicles. 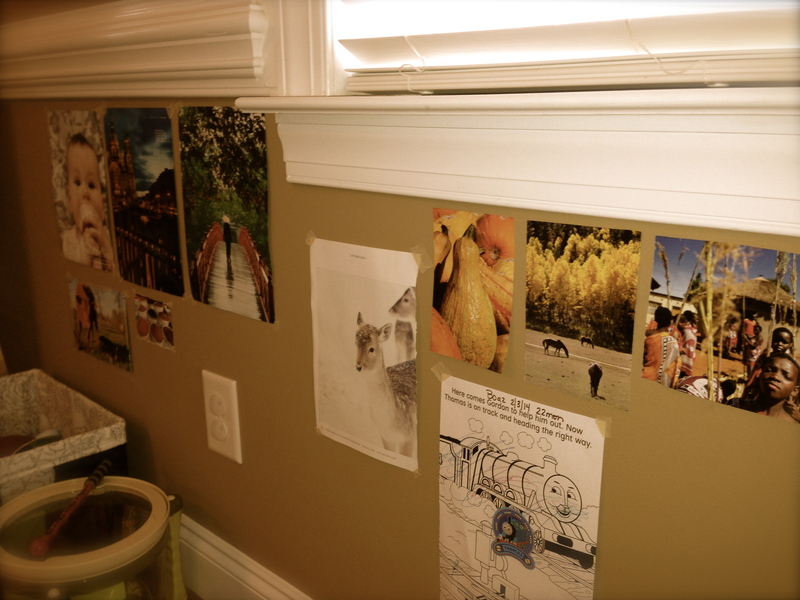 He also loves it when I put up new pictures that I have cut out from magazines. He’ll point to pictures and we talk about them. 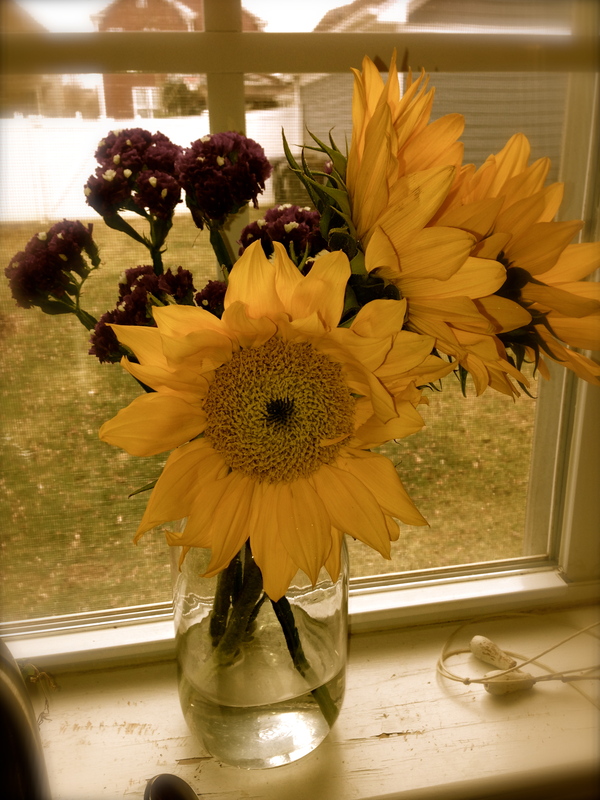 I also bought some sunflowers. Just thought they looked pretty! Come on spring! 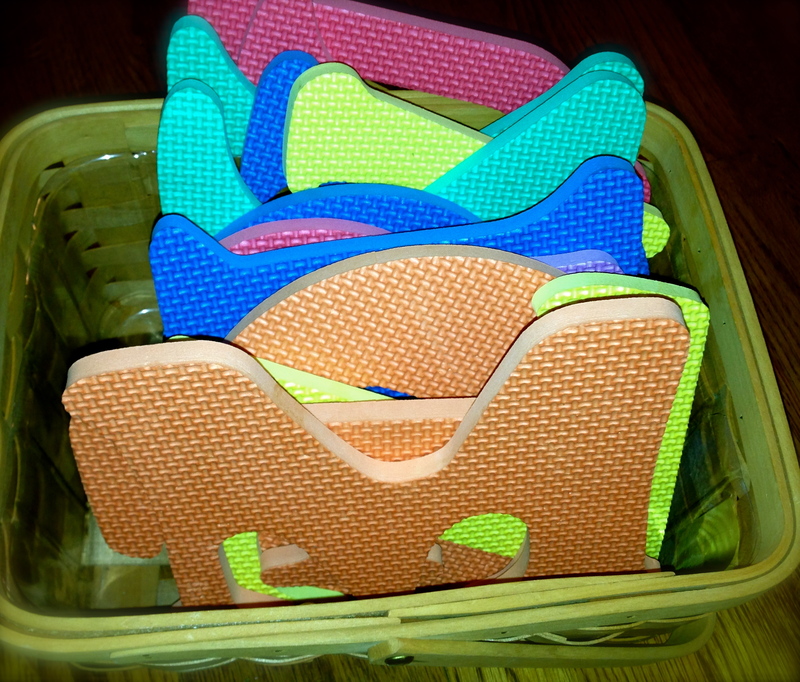 Categories: Toddler | Tags: activities, colors, DIY, Games, memory, Montessori, pinching, sorting, Toddler | Permalink. What’s for dinner? My go-to dinner is a one pot meal of couscous and bulgur with peas. Both these grains are fast cooking and healthy. Boil about 4 cups of veggie or chicken broth, reduce to a simmer and add 1 cup of couscous and 1 cup of bulgur. Couscous is a light, fluffy grain when cooked and bulgur is dark and heavy, so they work well together. It only takes about 10 minutes of simmering before the grains have absorbed all the broth. I usually have to add another 1/2 cup of broth to make it moist and fluffy. I usually add about 1 to 1.5 cups of frozen peas after the grains are cooked. I detest overcooked, discolored peas. Mixing in the frozen peas at the end to sit in the pot with the lid on (burner off) is usually enough to warm up the frozen peas sufficiently. If you so choose, you can add in some leftover meat. Here I added some chopped up rotisserie chicken from the night before. This is a picture I posted on Instagram last week. I stirred in the chopped chicken at the end along with the frozen peas. This meal is very simple, cheap and toddler approved. Worst case, they pull out the chicken and peas! This meal was also hubby approved and I think he’s more picky than my toddler. The next morning, I heated the mixture up with a few scrambled eggs and parmesan cheese in the frying pan. You can also add a few tablespoons of olive oil, patty the mixture into couscous cakes and pan fry them. Keep it simple my friends. 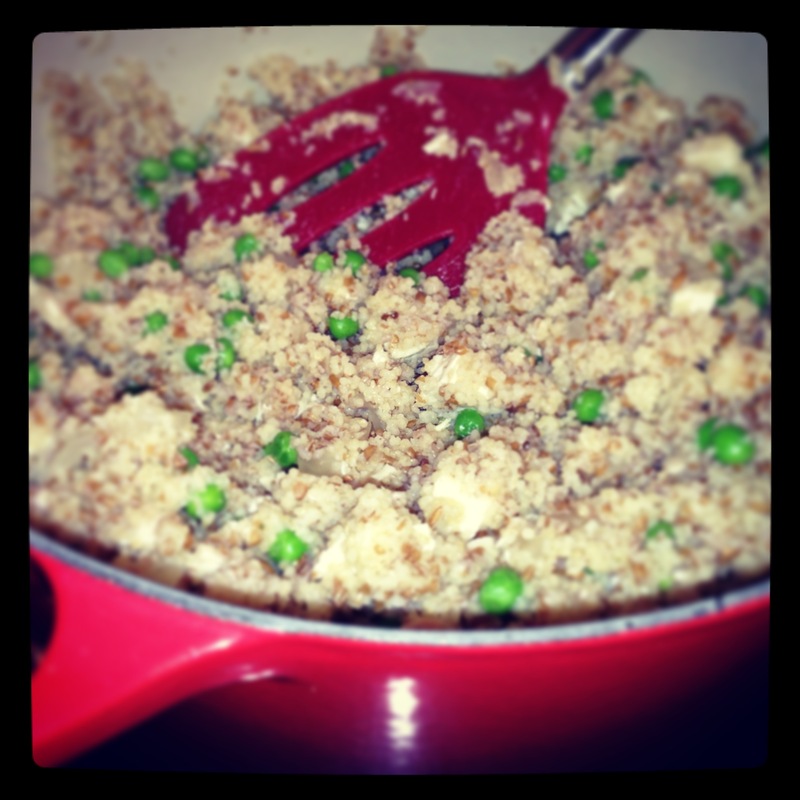 Categories: Recipes, Toddler | Tags: bulgur, chicken, couscous, dinner, one pot meals, peas, recipe | Permalink.